All of your Appointments, Assignments, Attendance records, Chores and Day Off entries are stored in the Agenda and can be viewed in the List view and Calendar view. This Help Page deals exclusively with the Agenda - Calendar View. See the Agenda - List View Help Page for details on that area of the program. 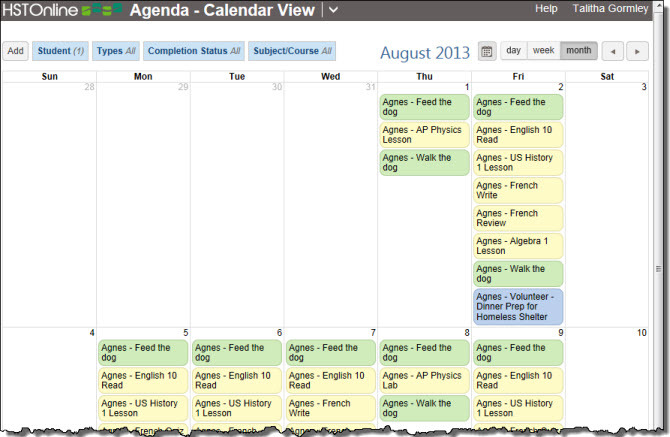 You will use the Agenda - Calendar View filters to determine which Student and Date you want to view. The Types, Completion Status, and Subject/Course filter settings are shared between the List View and the Calendar View. The primary purpose of the Agenda - Calendar View is to provide a way of looking at your created items in a day, week, or month calendar format. It is best to use the Agenda - List view to perform various actions on your Assignments, Chores and other items such as copying, multi-editing, deleting, rescheduling, etc. However, you can add new items, and edit or delete existing items one at a time, and mark Assignments and/or Chores as complete one at a time, from the Calendar View if you wish. Further details on these actions are detailed below. In the Agenda - Calendar View, you can view any one or more of the different item types for any one or more Students at a time for a Day, a Week or a Month. You can move back and forth between views as needed. The single date you select on the calendar will determine which day, week or month is displayed. The header will show what month/year you are viewing at any time. Filter Panel: Use the Students, Type, Completion Status and Subject/Course filters to determine which items will be displayed in the Agenda - List View. Please see the below for complete details. Click or touch the Calendar icon to select a date. Today's date is always listed at the bottom of the calendar, and you can click or touch on it to quickly move back to today"
Click or touch the Day, Week or Month button to change your view. You will be taken to the Day, Week or Month that contains the date you selected in the calendar. Click or touch the left or right arrow buttons to move backward or forward a day, week, or a month in time - depending on which view you have currently active. Day: View the items for any one date of your choosing. Click or touch the 'Day' button to choose this view. Use the Calendar icon to select a date. Use the left or right arrow buttons to move backward or forward by a day. The 'all-day' area will expand as much as necessary to accommodate the number of items designated as 'all-day'. Week: View the items for any week, Sunday to Saturday. Click or touch the 'Week' button to choose this view. Use the Calendar icon to select a date, and HSTOnline will display the week that contains the selected date. Use the left or right arrow buttons to move backward or forward by a week. The 'all-day' area will expand as much as necessary to accommodate the number of items designated as 'all-day'. Month: View the items for any month. Click or touch the 'Month' button to choose this view. Use the Calendar icon to select a date, and HSTOnline will display the month that contains the selected date. Use the left or right arrow buttons to move backward or forward by a week. Each week sill expand as much as necessary to accommodate the number of items on each date. You can choose to have your Agenda - Calendar View display Time or Blocks in the left column. Make your selection in the Program Options: Agenda menu. When using Time, each Assignment, Appointment or Chore you create can be slotted into a specific time frame. When using Blocks, each Assignment, Appointment or Chore you create can be tied to a particular Block - from 1 to 20 - in the day. The Block option works best for those who would like to designate a particular order in which Assignments, Appointments and Chores should be completed, but who do not want to be tied to specific times of day. See the Blocks vs. Start/End Times Help Page for more information. All Day Items in Agenda - Calendar View: Attendance and Day Off entries have no specified Start/End Times or Blocks and therefore fall into the 'all day' section at the top of the date column. Appointments, Assignments and Chores which have no specified Start/End Times or Blocks will also appear in the 'all day' section. In the Agenda - Calendar view, items are given a background color according to their type. The color will also appear in the top line of the tool tip window that opens to show you more about an item you have clicked on in the Agenda - Calendar view. Completed Assignments have a slightly darker background than incomplete Assignments; completed Chores have a slightly darker background than incomplete Chores. In Program Options: Agenda you can choose to use these same colors as the background color for the Type column to help you visually differentiate between the different items in your list. In the Agenda - Calendar View you can view Appointments, Assignments, Attendance, Chores and Day Off entries for one Student at a time for a day, week or month of your choosing. While there will be times when you want to see all those things at once, there are other times when you'll want to concentrate on certain items. The Filter options help you do just that. In the Student filter, select the Students whose items you want to view at this time. In the Agenda - Calendar View you can view items for just one Student, multiple Students, or All Students at a time for any Day, Week or Month of your choosing. On the HSTOnline menu, click or touch 'Agenda - Calendar View' under the 'Schedules and Planning' section. 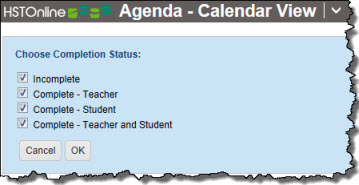 On the Agenda - Calendar View page, click or touch Students in the filter panel. The filter will display 'All' if all Students are included in the view, or it will display the number of Students being viewed if you have selected fewer than all Students in the filter. Click or touch the checkbox for each Student you want to include in the view. Use the Types filter to choose which kinds of items are displayed for the Date Range, Student, Completion Status and Subject/Course filters you have set. You can choose one or more of the following: Appointments, Assignments, Attendance, Chores and/or Days Off. The settings of the Types filter are shared between the Agenda - Calendar View and Agenda - List View. If you change the Type filter in the Agenda - Calendar View, the Type filter will be changed in the Agenda - List View and vice versa. On the HSTOnline menu, click or touch Agenda - Calendar View under the 'Schedules and Planning' section. On the Agenda - Calendar View page, click or touch Types in the filter panel. The filter will display 'All' if all item types are selected. It will show a number to indicate the number of different types selected if fewer than all 5 types are checked. The settings of the Completion Status filter are shared between the Agenda - Calendar View and Agenda - List View. If you change the Completion Status filter in the Agenda - Calendar View, the Completion Status filter will be changed in the Agenda - List View and vice versa. Completion Status only affects Assignments and Chores as these are the only two of the five items types which can be marked as completed. On the Agenda - Calendar View page, click or touch Completion Status in the filter panel. The filter will display the current settings you are viewing. The first time you visit the Agenda - Calendar View, the Completion Status filter will be set to the 'All Active Students' option. Complete - Teacher: Items which have a checkmark in the Teacher Complete bos but not in the Student box (or if the Student Complete field is hidden) will be included in the display. If you have selected fewer than all of the options, those number of Completion Status settings selected will be displayed on the filter panel. Use the Subject/Course filter to determine which Assignments will be displayed for the Date Range, Student, and Completion Status filters you have set. The Subject/Course filter affects only Assignments as they are the only item type which can have a Subject/Course affiliation. The settings of the Subject/Course filter are shared between the Agenda - Calendar View and Agenda - List View. If you change the Subject/Course filter in the Agenda - Calendar View, the Subject/Course filter will be changed in the Agenda - List View and vice versa. On the Agenda - Calendar View page, click or touch Subject/Course in the filter panel. The filter will display the current settings you are viewing. 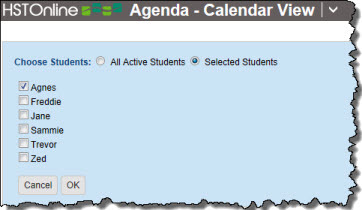 The first time you visit the Agenda - Calendar View, the Student Filter will be set to the 'All Subjects/Courses' option. Any Assignments which meet your Date Range, Student, and Completion Status filters will be displayed for all Subjects/Courses in your database. Clicking or touching to remove a checkmark next to a Subject will only remove that single checkmark, excluding any Assignments that have that Subject attached but not related Courses. When you click or touch on any item in the Agenda - Calendar View, a Tool Tip window will open giving you additional information and options for that item. The size of the window will adjust to the content it contains. Click or touch the 'x' in the top right corner of a Tool Tip to close it, or click or touch on another item in the Calendar to open switch from the current tool tip to another. You can drag an open Tool Tip to a different location on the window if you like. The tool tip banner is blue and shows the item type and date. If the item has a specified start time or a specified block other than zero, that information will also appear in the banner. The body will show the Event name. Delete: only appears when signed in under an Administrator or Teacher account. Click or touch 'Delete' or the red 'X' next to 'Delete' to open the Confirm Delete window. Click or touch 'Never Mind' to keep the item; click or touch 'Yes, I'm Sure' to remove the Appointment from your database. Deleted items cannot be retrieved. More: opens the Edit Appointment window to show additional information and allow editing according to the user account permissions. The tool tip banner is yellow and shows item type and date. If the item has a specified start time or a specified block other than zero, that information will also appear in the banner. Links: The links attributed to the assignment. Clicking on a link will open the destination in a new tab or window according to your browser settings. If grading is on and the assignment is marked as Complete - Teacher, the percentage grade will be displayed with the points earned and points possible displayed below it. When you mark an Assignment as Complete - Teacher and the Assignment has points possible entered greater than zero, you will have an opportunity to enter the points earned (Fig. 3). You can change the points possible and/or enter points earned in the fields provided. Click or touch Continue to have the grade calculated; click or touch Cancel to mark as complete without entering a grade. Note - if there are points possible greater than zero, points earned of zero, and the Assignment is marked as Complete - Teacher, the Student will receive a grade of 0%. Student: Only appears when the Complete by Student field is enabled. Checkmark shows as gray when not marked as complete (Fig. 1), shows as green when marked as complete (Fig. 5). 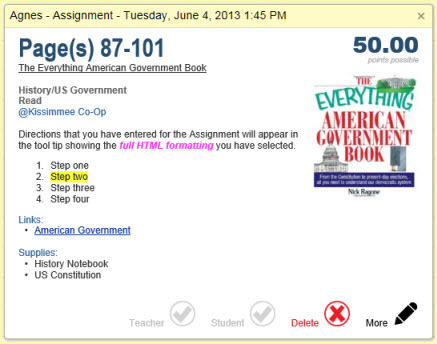 Click or touch 'Student' or the checkmark next to 'Student' to mark the item as Student Complete. Delete: only appears when signed in under an Administrator or Teacher account. Click or touch 'Delete' or the red X next to 'Delete' to open the Confirm Delete window (Fig. 4). Click or touch 'Never Mind' to keep the item; click or touch 'Yes, I'm Sure' to remove the Assignment from your database. Deleted items cannot be retrieved. More: opens the Edit Assignment window to show additional information and allow editing according to the user account permissions. The tool tip banner is lavender and shows item type and date. If you are tracking Manual Hours, Time Spent or Sessions along with Attendance, that information will be listed in parentheses following the 'Present' or 'Present 1/2 Day' entry. Delete: only appears when signed in under an Administrator or Teacher account. Click or touch 'Delete' or the red 'X' next to 'Delete' to open the Confirm Delete window. Click or touch 'Never Mind' to keep the item; click or touch 'Yes, I'm Sure' to remove the Attendance entry from your database. Deleted items cannot be retrieved. More: opens the Edit Attendance window to show additional information and allow editing according to the user account permissions. The tool tip banner is green and shows item type and date. If the item has a specified start time or a specified block other than zero, that information will also appear in the banner. The body will show the Chore name and any directions entered for that chore. Teacher: Checkmark shows as gray when not marked as complete, shows as green when marked as complete. Click or touch 'Teacher' or the checkmark next to 'Teacher' to mark the items as Complete - Teacher. Student: Only appears when the Complete by Student field is enabled. Checkmark shows as gray when not marked as complete, shows as green when marked as complete. 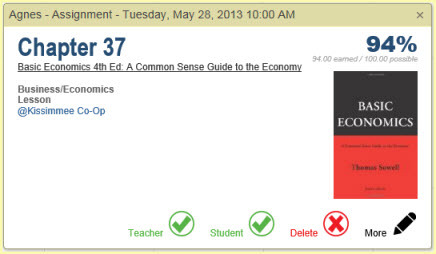 Click or touch 'Student' or the checkmark next to 'Student' to mark the item as Student Complete. Delete: only appears when signed in under an Administrator or Teacher account. Click or touch 'Delete' or the red 'X' next to 'Delete' to open the Confirm Delete window. Click or touch 'Never Mind' to keep the item; click or touch 'Yes, I'm Sure' to remove the Chore from your database. Deleted items cannot be retrieved. More: opens the Edit Chore window to show additional information and allow editing according to the user account permissions. The tool tip banner is rose and shows item type and date. The body will show the Day Off type and description. Delete: only appears when signed in under an Administrator or Teacher account. Click or touch 'Delete' or the red 'X' next to 'Delete' to open the Confirm Delete window. Click or touch 'Never Mind' to keep the item; click or touch 'Yes, I'm Sure' to remove the Day Off entry from your database. Deleted items cannot be retrieved. More: opens the Edit Day Off window to show additional information and allow editing according to the user account permissions. Use the options under the Add button to add any one or more new entries for Appointments, Assignments, Attendance, Chores and/or Days Off. Adding items to the Agenda - Calendar View will also add them to the Agenda - List View and vice versa. The two views just provide two different ways to view the same items - in list view or in a day, week or month calendar view. The primary purpose of the Agenda - Calendar View is to provide a way of looking at your created items in a day, week, or month calendar format. It is best to use the Agenda - List view to perform various actions on your Assignments, Chores and other items such as copying, multi-editing, deleting, rescheduling, etc. However, you can add new items to the Agenda - Calendar View and, one at a time, edit or delete existing items and mark Assignments and/or Chores as complete from the Calendar View if you wish. 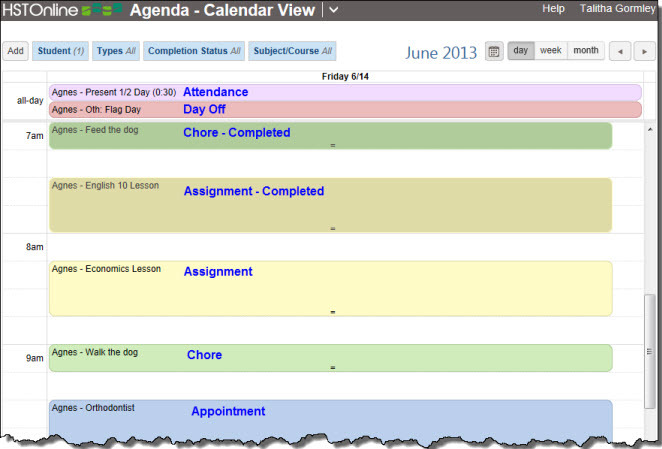 You can edit any single Appointment, Assignment, Attendance record, Chore or Day Off in the Agenda - Calendar view. To edit multiple items of the same type at the same time, use the Multi-Edit action in the Agenda - List View. 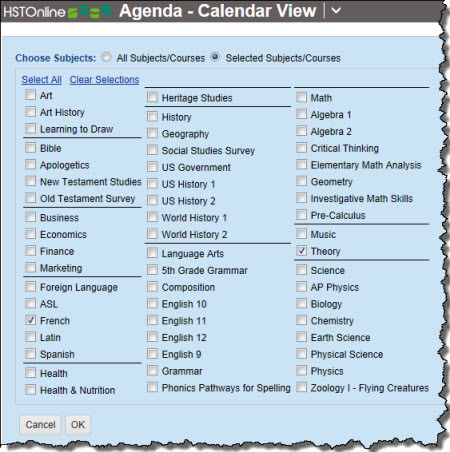 On the HSTOnline menu, click or touch 'Agenda - Calendar View' in the 'Schedules and Planning' box. Set the filters to view the item you want to change. Click or touch on the item you want to change to open the tool tip window. Make any needed changes according to the user account permissions. Click or touch Save to keep your changes and return to the Agenda - Calendar View. 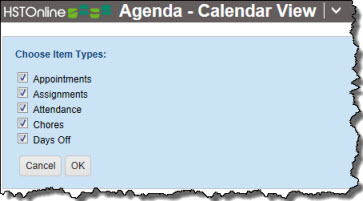 You can drag-and-drop items around the Agenda - Calendar view to change the date and time/block associated with the item. If you are using Auto-Attendance, your Attendance records will be automatically updated based on your drag-and-drop changes. Days will be marked as Present, Present 1/2 Day, show changes to Time Spent or Sessions totals, or have those notations removed based on the moving of Assignments. Drag-and-drop is not available on touch devices. To change dates or time/block details on a touch device, you will need to utilize the edit action, noted above. Or use the Multi-Edit action of the Agenda - List View. Click and drag any item to another time or into the 'all day' area. Moving an item into the 'all day' area will remove the start/end times or block designation from that item. Click and drag the item handle to lengthen the time frame of an item with start/end time or block designations. You cannot rearrange the order of 'all day' items with drag and drop. To change their order, edit the item and change the value in the Order field. Click and drag any item onto another date. Click and drag any item to another date. The original start/end times, block designation, or lack thereof, will remain the same when moving items around in the month view. You can delete any single Appointment, Assignment, Attendance record, Chore or Day Off in the Agenda Calendar view. To delete multiple items of the same type at the same time, use the Delete action in the Agenda - List View. Set the filters to view the item you want to remove. Click or touch on the item you want to remove to open the tool tip window. Click or touch 'Delete' to open the Confirm Delete window for that item. The Delete option will only appear when signed in under an Administrator or Teacher account. Click or touch 'Never Mind' to keep the item; click or touch 'Yes, I'm Sure' to remove the Day Off entry from your database. Deleted items cannot be retrieved.